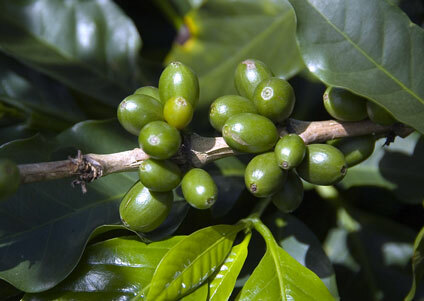 A bush of bright green coffee berries is photographed at a coffee plantation in Costa Rica. The sun reflects off of the berries, evoking feelings of lush, warm tropics. The coffee will soon be processed, and it will travel long distances to end up as a hot beverage in cups on breakfast tables across the world.